Blueskin was a gray horse ridden by George Washington. He was one of Washington's two primary mounts during the American Revolutionary War. The horse was a half-Arabian, sired by the stallion "Ranger", also known as "Lindsay's Arabian", said to have been obtained from the Sultan of Morocco. Blueskin was a gift to Washington from Colonel Benjamin Tasker Dulany (c. 1752–1816) of Maryland. Dulany married Elizabeth French, a ward of Washington's, who gave her away at her wedding to Dulany on February 10, 1773. In addition to being the nation's first President and his leadership during the Revolutionary War, George Washington was also known for initiating Presidential pets. Horses have become a valuable asset throughout military history. Effectively trained war horses became formidable enough to match the deadliness of their riders. In addition to physicality, they had considerable psychological impact on soldiers by boosting morale and courage, or instilling fear in the enemy. The impact of horses boosted the efficiency of militaries and their strategies. While horses are largely ignored in accounts of famous battles, they ultimately were a critical contribution to success, such as that of the American Revolution. 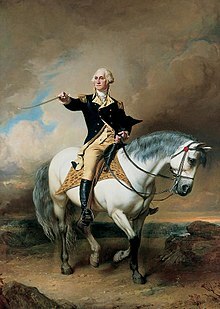 Blueskin was a favorite of George Washington; due to his Arabian bloodline, the horse had "great endurance and could carry Washington (who was said to be over six feet tall) all day on the march or in battle." However, Washington preferred to ride his other horse, Nelson, in battle since Blueskin was prone to skittishness around gunfire and cannon blasts while Nelson was more composed in those circumstances. Though Blueskin did not see as much battle as Nelson, he is the horse who appears most frequently in paintings of George Washington as a general in the Revolution. Blueskin was preferred for portraits because of his white hair coat, as opposed to Nelson's chestnut coat. Grays are born darker, but adult hair coat often becomes pure white, and their skin is black, which can appear bluish in sunlight (thus the name). It is uncertain whether any contemporary portraitists who painted George Washington with Blueskin had the horse standing as a subject (Peale and Faed certainly did not; Faed had never traveled to America). These portraits are unlikely accurate representations of Blueskin; rather, pastiches borrowed from other paintings, such as David's equestrian portrait Napoleon Crossing the Alps. Judging from the Roman nose and rounded croup with a low tail set illustrated in these paintings, the horse modeled was likely of Andalusian descent. This would also fit with Blueskin's pedigree as a descendant of a Moroccan sire, because the barb horses of northwestern Africa are also very likely to be descended not from "Arabians" but from Spanish horses. ^ Hur, Ben. "Washington's Best Saddle Horse". Western Horseman. Retrieved 20 December 2014. ^ University of Virginia. "Frequently Asked Questions: Military/Government". The Papers of George Washington. University of Virginia. Archived from the original on 13 December 2006. Retrieved 2006-11-21. ^ "Maryland Historical Magazine". Google Books. Retrieved 14 September 2016. ^ Feldman, Laura. "Horses of War". American Cowboy. Retrieved 20 December 2014. ^ "Founders Archives". From George Washington to Elizabeth French Dulany, 23 November 1785. Retrieved 14 September 2016. ^ "George Washington's Blueskin - Presidential Pet Museum". Presidential Pet Museum. Retrieved 2018-05-22. ^ "Washington's Best Saddle Horse - CMK Arabian Horses". CMK Arabian Horses. 2006-07-05. Retrieved 2018-05-18. ^ "Horses of War". American Cowboy | Western Lifestyle - Travel - People. Retrieved 2018-05-22. ^ Horseman, The Accidental. "Presidents and Horses: George Washington and Horses Blueskin and Nelson". hglanham.tripod.com. Retrieved 2018-05-22. ^ "George Washington's Blueskin - Presidential Pet Museum". Presidential Pet Museum. Retrieved 2018-05-23. ^ "Nelson and Blueskin: The First Horses of the United States | HORSE NATION". www.horsenation.com. Retrieved 2018-05-23. ^ "Washington before Yorktown". www.nga.gov. National Gallery of Art. Retrieved 21 February 2018. This page was last edited on 21 February 2019, at 02:03 (UTC).